An unaltered photocopy of your DD-214 or Data Verification Brief OR other military issued document(s) authorizing your AFCAM authorization. 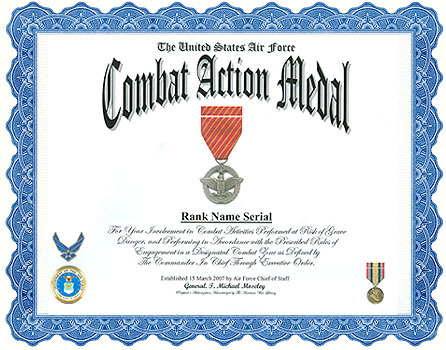 On 15 March 2007 the SECAF approved establishment of the Air Force Combat Action Medal (AFCAM) to recognize any military member of the Air Force (Airman Basic thru Colonel) who actively participated in combat (ground or air). The principal eligibility criterion is that the individual must have been under direct and hostile fire while operating in unsecured space (outside the defended perimeter), or physically engaging hostile forces with direct and lethal fire. The Commander, Air Force Forces (COMAFFOR) is the award authority for the AFCAM. The award criteria for the AFCAM are similar to that of other US Services but are more specific with regard to combat conditions criteria. Personnel who earned the Combat Infantryman Badge, Combat Action Badge, Combat Medical Badge or Combat Action Ribbon while assigned with the U.S. Army, U.S. Navy or U.S. Marine Corps may submit a copy of that award, along with other documentation required in this message, to the COMAFFOR for consideration for award of the AFCAM. The AFCAM may be awarded to members from the other U.S. Armed Forces and Foreign Soldiers serving in a U.S. Air Force unit, provided they meet the award criteria. Individual must be in combat conditions as defined in "Combat Conditions Defined"above. Combat must take place in a Combat Zone defined as a geographic area designated by the President via Executive Order, or a qualified hazardous duty area in which a member is receiving Imminent Danger Pay or Hostile Fire Pay (IDP/HFP). Individual must be physically present, at risk of grave danger, and performing in accordance with the prescribed rules of engagement. Personnel outside the defended perimeter must be fired upon by the enemy with lethal weapons; returning fire is situation dependent and not necessarily a precondition of award. Risk of grave danger to the individual must be detailed in the award submission. Encampments, compounds, and protected areas (inside the defended perimeter) will normally not qualify as venues for this award unless the individual is serving in a defensive capacity, taking fire, and engaging the enemy. Augmenting a defensive fighting position and taking fire, regardless official duties, would also qualify as combat action if all other criteria were met. Receiving mortars, responding to alarm condition, reporting to bunkers, do not independently constitute combat action for the purpose of this award. However, should combat conditions arise out of such events then exceptions to policy with full justification can be submitted. Personnel eligible for the award of the Purple Heart do not automatically qualify for the combat action medal. Purple Heart recipients must apply for the AFCAM through the appropriate award channels. Individual must be flying as authorized aircrew members on aeronautical orders in direct support of a combat zone and in combat as define in combat conditions. Combat must take place in a combat zone defined as a geographic area designated by the President via Executive Order, or a qualified hazardous duty area in which a member is receiving Imminent Danger Pay or Hostile Fire Pay (IDP/HFP). Individual must be physically present, at risk of grave danger, and performing satisfactorily in accordance with the prescribed rules of engagement. Individual must be performing assigned duties. Traveling passengers, including aircrew manifested as passengers, on an aircraft are not eligible based solely on their presence if the aircraft were to come under fire. The AFCAM may be awarded for qualifying service from 11 September 2001 to a date to be determined. 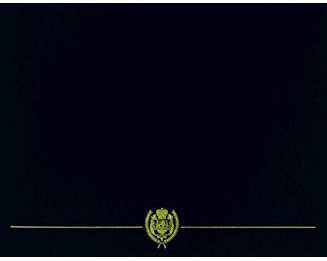 Retroactive awards prior to 11 September 2001 are not authorized. There is no minimum time-in-theater requirement to qualify for the AFCAM. Only one AFCAM may be awarded during a qualifying period. Subsequent qualifying periods will be determined by SECAF. Only one award per operation is authorized. OIF/OEF is considered one operation. Subsequent operations will be approved by the CSAF and will be indicated by the use of Gold Star on the ribbon and medal. Requests for exceptions to policy established here or in future instructions must be justified and forwarded though command channels. Home station will route request through MAJCOM/CC to the COMAFFOR to AF/CV. AF/CV has been designated decisional authority by SECAF for all AFCAM Exception to Policy requests. In-theater requests for exception will route through COMAFFOR to AF/CV. The AFCAM is awarded as a medal and ribbon only and is worn according to current medal and ribbon instructions. There will be no patch or badge equivalent for wear on the ABU, BDU and other functional uniforms that are worn for daily duties and deployments. Further guidance will be added to AFI 36-2803. The AFCAM shall be worn directly between the Air Force Achievement Medal (AFAM) and the Air Force Presidential Unit Citation (AFPUC). For an Airman to wear the AFCAM, a narrative explanation on an AF Form 3994 of the Airman's involvement in combat activities must be submitted by a person with first-hand knowledge of the incident to the first O-6 (colonel) in their operational chain of command. The application will be processed through the chain of command and eventually be approved or disapproved by the Commander of Air Force forces (COMAFFOR). The AFCAM will be the highest-level Air Force individual award to not earn points under the Weighted Airmen Promotion System. It is worn directly after the Air Force Achievement Medal and before the Air Force Presidential Unit Citation. 4/9/2007 - WASHINGTON (AFNEWS) -- Air Force officials at the Air Force Personnel Center released criteria this week for award of the new combat action medal, an award for Airmen who have been involved in direct fighting situations where they risked their lives in an enemy engagement. Air Force Chief of Staff Gen. T. Michael Moseley authorized the medal's creation March 15. Any Airman who believes he or she may be eligible can now submit an award package for consideration. The first approval of the Air Force Combat Action Medal is expected with in the next few weeks, according to John Balducci, the chief of Air Force recognition programs. A combat zone is defined as a geographic area for which an Airman receives imminent danger/hostile fire pay. In addition, while encampments, compounds and protected areas aren't normally qualifying locations for the AFCAM, Airmen augmenting a defensive fighting position could be eligible should they meet the award criteria, Mr. Balducci said. Aircrew members must be flying in direct support of a combat zone and in combat. They also must be performing official duties and not manifested as a passenger. While performing close air support, taking fire from an enemy is not a prerequisite as long as the Airman is at "great risk," Mr. Balducci said. "For Airmen still on active duty who believe they may be eligible for the medal, their submission must include a narrative explanation of circumstances on an Air Force Form 3994 describing the event, to include date, time, location and incident details, as well as witness statements," Mr. Balducci said. "That package should be submitted to the first 0-6 (colonel) in their operational chain of command, who will submit it to the commander of Air Force forces." Award eligibility is retroactive to Sept. 11, 2001, through a date to be determined and is available across the total force. Personnel no longer on active duty can submit packages to the Board for Correction of Military Records. This will apply to posthumous awards as well, he said. The medal does come with some restrictions. For example, only one can be awarded during a qualifying period, and for now, operations Enduring Freedom and Iraqi Freedom count as one eligible time frame. In addition, there are no promotion points for the AFCAM. However, events that garner the combat action medal also can be referenced for other decorations, Mr. Balducci said. The AFCAM is worn between the Air Force Achievement Medal and the Air Force Presidential Unit Citation. The medal is designed to evoke Air Force heritage, scarlet with diagonal yellow stripes - adapted from the art insignia on the aircraft of Gen. Billy Mitchell, who coordinated the first air-to-ground offensive in history. Further, the AFCAM features an eagle grasping arrows in one talon and an olive branch in the other, the arrows reflecting preparedness for war while the olive branch represents a goal of peace, according to official Air Force wear guidance. For more information, Airmen should contact their local military personnel flight or the Air Force Contact Center at DSN 665-5000 or (800) 616-3775.